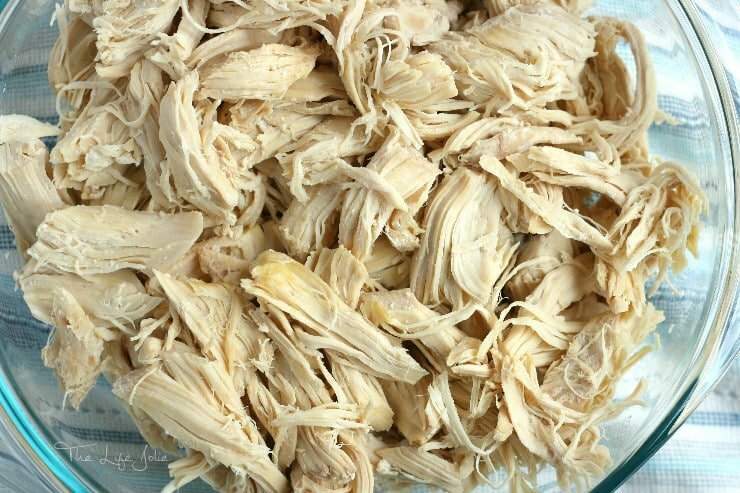 Make your meal prep or weekday night dinners even easier with this super-easy slow cooker shredded chicken. Perfect for your Crockpot or Instant Pot, it’s great make it in advance or freeze for future meals in a pinch. When life gets busy, I like to use one of my favorite kitchen hacks for making chicken breast recipes come together much quicker. Unless a recipe specifically calls for cut up chunks of chicken, I always make it with shredded chicken because I prefer the texture. My love for my slow cooker and instant pot runs deep because anything that lets me throw ingredients into a pot and then does all the work for me during the day is a definite win as far as I’m concerned. 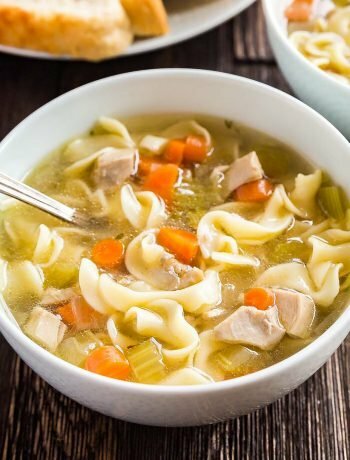 The cooking water makes a great base for chicken stock- save it for soup or stock! When freezing, shred the chicken minimally or it may end up mealy. In general most of the time when you’re mixing it into other recipes, it will shred up a little more, so go easy the first go-round. 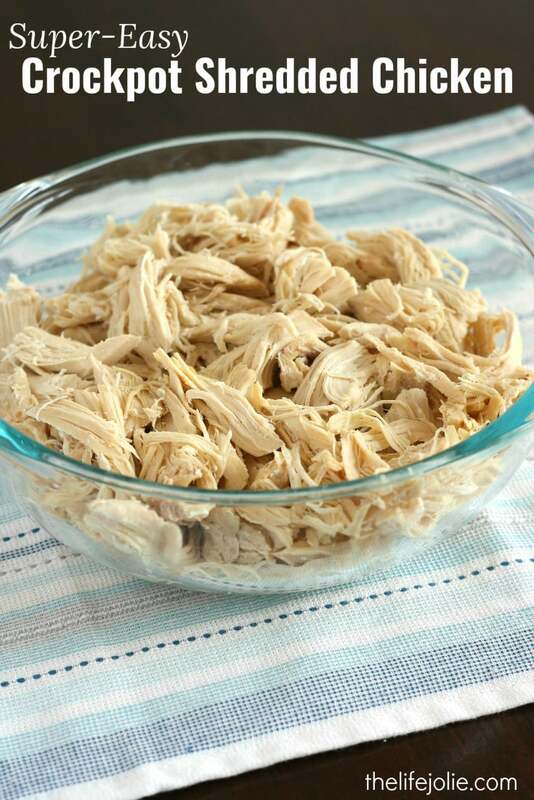 I’ve come across a variety of shredded chicken recipes, and while they’re all a little different, I like to keep it simple and straightforward, without adding extra seasonings. Do you have to use water? I generally use water for this hack. 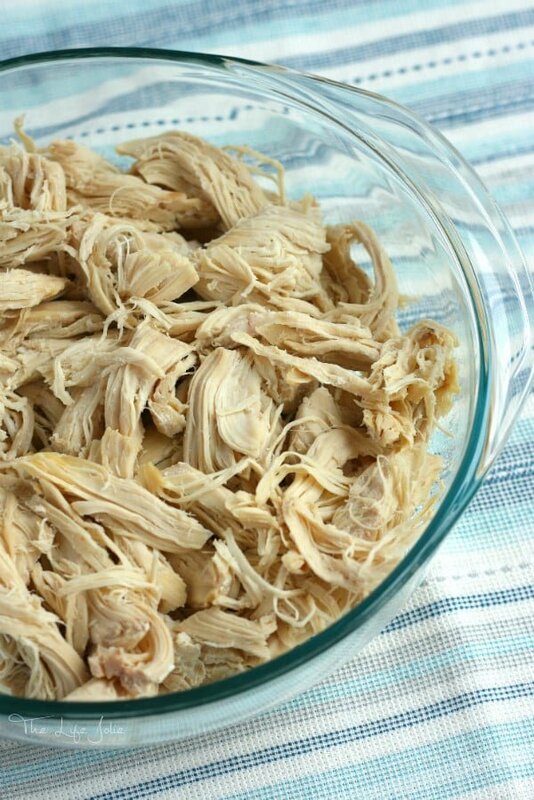 This plain slow cooker shredded chicken recipe works great for whatever recipe I’m making, it’s like a blank canvas. But you could always use broth, salsa, anything liquid-based if you wanted to add a specific flavor. Does it freeze well? This recipe can be used right away or frozen to use later (I measure out cups into small baggies). Remember not to over-shred! What is the best way to shred chicken? Some people use their kitchen stand mixers and blenders, others use two forks. Or, you can use handheld “meat shredder claws” if you’re feeling fancy. 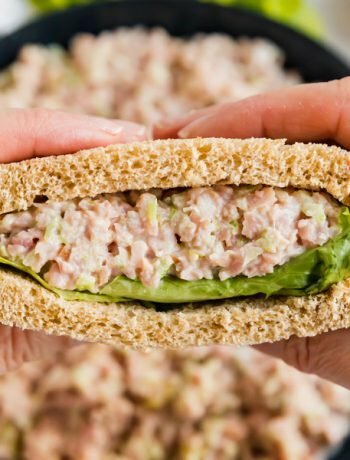 Can you shred raw chicken? That would be pretty difficult. It’s much easier to shred when cooked. How do you shred cold chicken? The same way you would warm chicken. That said, I find it a little easier to shred just after it’s been cooked. If falls right apart. 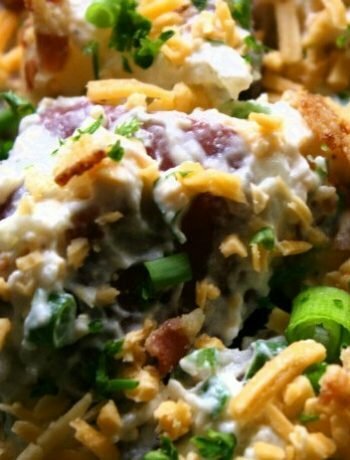 How much shredded chicken in a cup? Around 1 boneless skinless chicken breast (remember they do vary in size, so this is an approximation). How long will shredded chicken last in the fridge? Around 3-4 days covered. 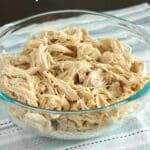 Make your meal prep or weekday night dinners even easier with this super-easy shredded chicken. Perfect for your Crockpot or Instant Pot, it’s great make it in advance or freeze for future meals in a pinch. Place the chicken breasts into slow cooker pot. Cover chicken breasts with water. Remove the chicken from the water and lightly shred (make sure you don’t over-shred the meat!). Freeze or add it to whatever recipe you’re making. Place the chicken breasts into the Instant Pot. Cover and set the Instant Pot to manual high pressure for 10 minutes. Make sure the steam release is set to sealing. When the time is up, allow it to natural pressure release for 10-15 minutes and then do a quick release. March 30, 2016 at 1:12 pm Me too, but I hate all the work that goes into shredding it. Thank goodness for the slow cooker!